Nephi saw a tree, whose fruit was the whitest and sweetest he had ever seen and tasted! He explained that the fruit filled his souls ‘with exceedingly great joy’. It was so desirable that he desired that all his family would partake of this fruit as well; “…as I cast my eyes round about, that perhaps I might discover my family also, I beheld a river of water; and it ran along, and it was near the tree of which I was partaking the fruit. And I looked to behold from whence it came; and I saw the head thereof a little way off; and at the head thereof I beheld your mother Sariah, and Sam, and Nephi; and they stood as if they knew not whither they should go… it came to pass that I beckoned unto them; and I also did say unto them with a loud voice that they should come unto me, and partake of the fruit, which was desirable above all other fruit.” (1 Nephi 8:13-15) Lehi was able to find Sariah, Sam and Nephi through the dark and dreary state. They followed the sound of Lehi’s voice so that they might also partake of the fruit of the tree. Lehi was also desirous that Laman and Lemuel would also partake of the fruit of this tree; however Laman and Lemuel did not hearken unto the voice of their father. Lehi goes onto explain more of his vision; “…I beheld a rod of iron, and it extended along the bank of the river, and led to the tree by which I stood… I also beheld a strait and narrow path, which came along by the rod of iron, even to the tree by which I stood; and it also led by the head of the fountain, unto a large and spacious field, as if it had been a world. And I saw numberless concourses of people, many of whom were pressing forward, that they might obtain the path which led unto the tree by which I stood.” (1 Nephi 8:19-21) Lehi see a ‘Rod of Iron’ that led from a strait and narrow path to the tree that produced this wonderful fruit. Lehi saw many people pressing forward to obtain this fruit! Lehi explains that there arose a mist of darkness that caused many to be led off the path and be lost. However, there were others who were determined that they might obtain the fruit of the tree; “…I beheld others pressing forward, and they came forth and caught hold of the end of the rod of iron; and they did press forward through the mist of darkness, clinging to the rod of iron, even until they did come forth and partake of the fruit of the tree.” (1 Nephi 8:24) Many made it through the darkness, and obtained the fruit of the tree. However, some of those who partook of the tree looked around and did cast their eyes as if they were ashamed. This is an example of the path we take to follow Jesus Christ, it is long and arduous, mists of darkness will overcome us… but if we hold to the word of God [The Iron Rod] we can make it to the Tree of Life. Many of those partake of the fruit of the Gospel of Jesus Christ will sadly fall away and are led to the ‘Great and Spacious Building’ that is the world and its worldly desires and passions! 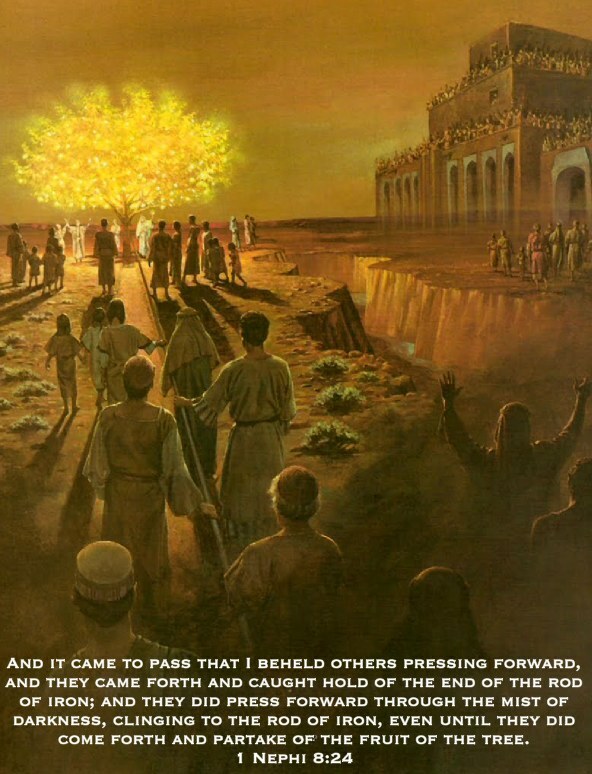 Nephi explains that Lehi had a vision of many people who did make it to the Tree of Life and many who fell away into forbidden paths to either be drowned in the river or to boast themselves in the Great and Spacious building of Sin. Lehi feared for Laman and Lemuel, because he desired that they should be more life their younger brothers Nephi and Sam. Lehi pleads with Laman and Lemuel to follow the commandments of the Lord that perhaps the Lord would be merciful unto them. This entry was posted in 1 Nephi, The Book of Mormon and tagged Christ, follow the commandments, Great and Spacious Building, Iron, Iron Rod, Jesus, Laman, Lehi, Lemuel, Nephi, Rod, Sam, Scriptures, Strait and Narrow, Tree of Life, Vison of Lehi. Bookmark the permalink.